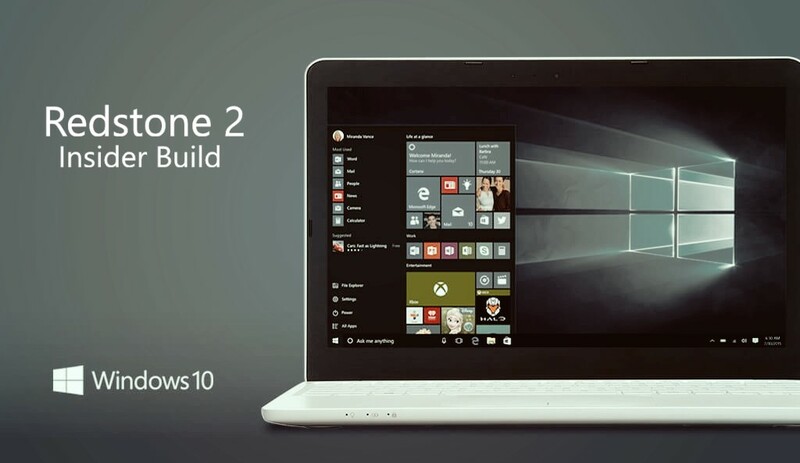 Microsoft is now seeding Windows 10 Redstone 2 build 14905 and Mobile build 10.0.14905.1000. The latest build is available to fast ring insider members only. The first Redstone 2 build 14901 was released a few days back. Microsoft warned insider members that latest Redstone 2 builds will be more buggy than usual. Build 14905 fixed an issue causing a large blank space to appear between the address bar and web content after the address bar moves back to the top when opening a new tab in Microsoft Edge. Build 14905 updated Narrator Scan mode for table navigation to now support CTRL + ALT + HOME to go to the beginning of the table CTRL + ALT + END to go to the end of the table. Microsoft Edge now supports the CTRL + O keyboard shortcut for setting focus to the address bar. Build 14905 also fixed an issue resulting in Sketchpad and Screen Sketch crashing after trying to change the ink color twice in a row when the ruler was visible. Cortana’s text to speech capabilities is not working in this build. For example, Cortana won’t be able to read text messages out loud for you, tell jokes, sing, or give verbal prompts. When clicking on the power button on the Start menu, it closes the Start menu without opening the flyout with restart/shutdown options appearing. As a workaround – you can right-click on the Start button (or WIN + X) and choose to shutdown via this menu instead. Apps such as Yahoo Mail, Trivia Crack, Google and the Skype Translator Preview app will crash in this build due to a compatibility issue from a recent platform change. The Settings app may crash on certain editions of Windows 10 when navigating to different settings pages due to a missing .dll file. We are working on getting this fixed soon. Build 10.0.14905 includes a newly refined sound set in this build, uniting the best of our past and present. Insider team aspire to set a new bar for mobile sound set quality, and are trying to make the soundscape of technology more beautiful and harmonious. This also helps align with new sound design direction of the Windows platform as a whole, so that mobile sounds will family with desktop and tablet and be feel instantly familiar to all Windows users. We will continue to evolve – head to Settings > Personalization > Sounds to see the updated list of available sounds and let us know what you think! Build 10.0.14905 Missed call notifications are now more actionable, with inline options to call back, text or remind yourself to do something about it later. Build 10.0.14905 also fixed an issue where videos played in Windows Phone 8 apps might not pause when an incoming call was received. Fixed an issue where, if “Show my caller ID” is set to “My contacts”, the contact being called might still see a blocked caller ID. Build 10.0.14905 fixed an issue where the Lock screen might fail to update to the new time after a time zone change. Fixed an issue resulting in music not resuming after a call was finished, if Turn-by-Turn directions were being read out from the Maps app when the phone call came in. If you move apps between a SD card and internal storage (either direction), those apps will get stuck in a pending state. The workaround to get your apps working again is to uninstall the app through Settings > System > Storage (apps cannot be uninstalled from All apps list). Then you can re-install the app from the Store. Microsoft next major updates Redstone 2 and Redstone 3 are coming in 2017. The company has already released Redstone 1 build 14393, which is also known as Anniversary Update for both PC and Mobile (build 14393.67) users. Update: There are reports that Windows 10 Mobile build 10.0.14905 is showing up for some insider members. Windows Insider team is looking into it. Hey #WindowsInsiders who are not getting the Mobile Fast Ring update today, we are investigating. I’ll let you know with more details.